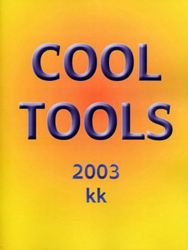 This version of Cool Tools is out of date. 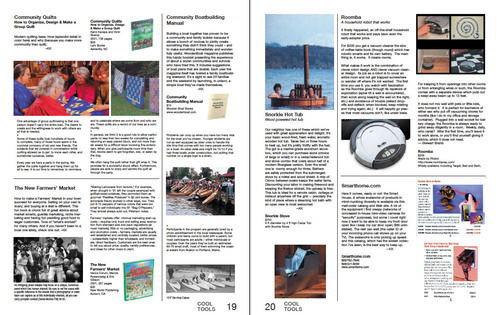 It is 12 years old, and a much smaller prototype version of the recent gigantic 2014 edition of the almost 500-page Cool Tools book, available here. I’m leaving this PDF for sale here for those completists who simply must have all editions. For everyone else I recommend the big new paper version. This collection of tool reviews has two origins. One is my life-long habit (begun in high school) of recommending stuff I discovered to classmates and friends, and requesting the same kind of tips from them. This addiction met its perfect home at the Whole Earth Catalogs, where I edited several compendia of tools. Indeed, a good portion of these pages appeared previously in two winter issues of Whole Earth Review much as it is presented here. (Future editions of this book will not be as derivative.) Additional material has been added from my Cool Tools email list — an ongoing outlet for my obsession with neat stuff. The other inspiration for this book is my intention to pass on to my three children a crate of tools and manuals that will be of use to them when they leave home. I want this box to include the types of things and ideas that they would not ordinarily encounter in college, but which would encourage a just-do-it education in them. Many of the items here are choosen with this hope is mind. This book will be one of the key tools in that crate, and will also serve as a catalog of the many good tools that can’t fit into the crate. I use the term “tool” liberally. Anything useful is a tool. It may be a gadget, a how-to-book, an amazing documentary, a great piece of software, an uncommon mail order catalog, a website, a piece of machinery, or something you grab with your hand. All these modes are candidates for this collection. I select stuff that I like, and ideally that I use. But I also rely heavily on suggestions from friends for tools they love. I include items that are 1) remarkable for their quality, 2) not commonly known, 3) useful for more than one thing, and 4) a doorway into possibilities for the passionate pursuer. I’ll consider this effort a success if I can incrementally include all the tools that would assist an intelligent enthusiast to try stuff and make things happen, and to have it all accessible from one place. You can help by letting me know what I’ve missed.